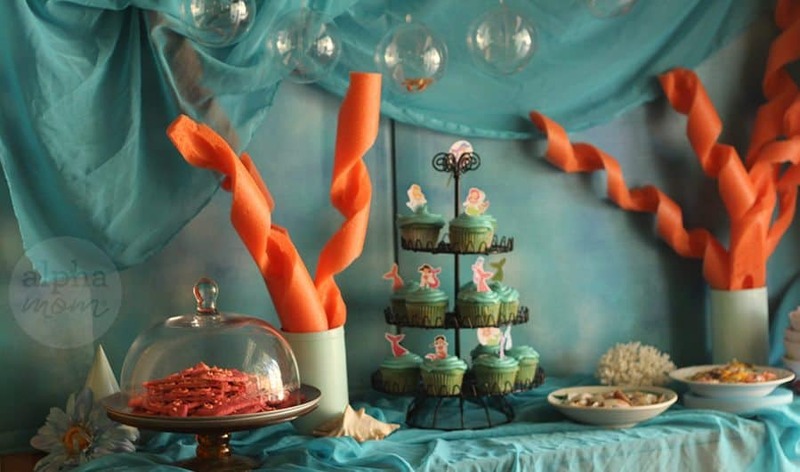 To me, nothing says let’s party under-the-sea better than a dressed-up dessert table. 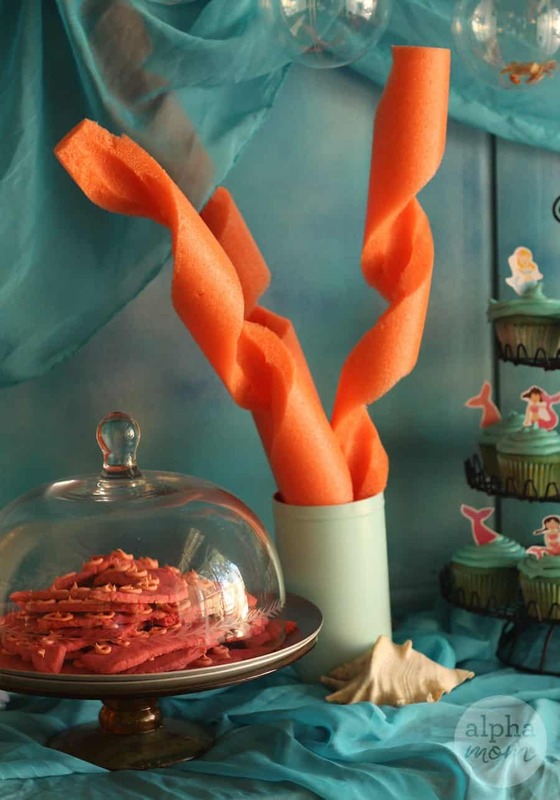 Here, we show you how we created a simple decorative party backdrop and fake pool-noodle coral for our Mermaid-Themed Craft and Pool Party. First we create your backdrop with a big piece of cardboard. Then spray-paint in three marbled colors of aqua and blue by overlapping three different shades of spray paint (please have an adult do this safely outside). Double-handed spray-painting is not necessary– but it’s fun– you might want to try it! After the paint dries, prop the painted cardboard up behind the buffet table and drape gauzy fabric over the top and below it on the table, making sure to let the fabric billow and fold naturally. Then string more of the same bubbles we used for the party invitations along a length of fishing line and hung that along the top of the painted cardboard. You could easily hang these vertically too but our ceilings really high and we are height challenged. Either way they look cool. Then we created some fake coral, using leftover pool noodles. We stuffed them into empty cookie tins that we had spray-painted blue to match the backdrop but you could put them in vases too. First, lay your pool noodle length horizontally on your cutting board and cut into it diagonally with your serrated knife until you get to the hollow center. Turn the noodle and gently move your knife down the noodle in spiral like so. Be really careful don’t cut all the way through. It’s easy to get a nice spiral cut by turning the noodle as you cut and cutting along at an angle. Do this twice. The second time cutting between your first cut and easing it down the noodle the same way. Then gently pull the two pieces apart from each other. If your cuts don’t go all the way through, don’t worry you can gently loosen them with your hands. Pull your pieces apart, stuff them into a can or vase and there you have it, fake coral! Decorate your table with your desserts in pretty dishes and surround them with shells and clear marbles. Your dessert table will be pretty enough for any mermaid to dine from (or take a selfie in front of!). 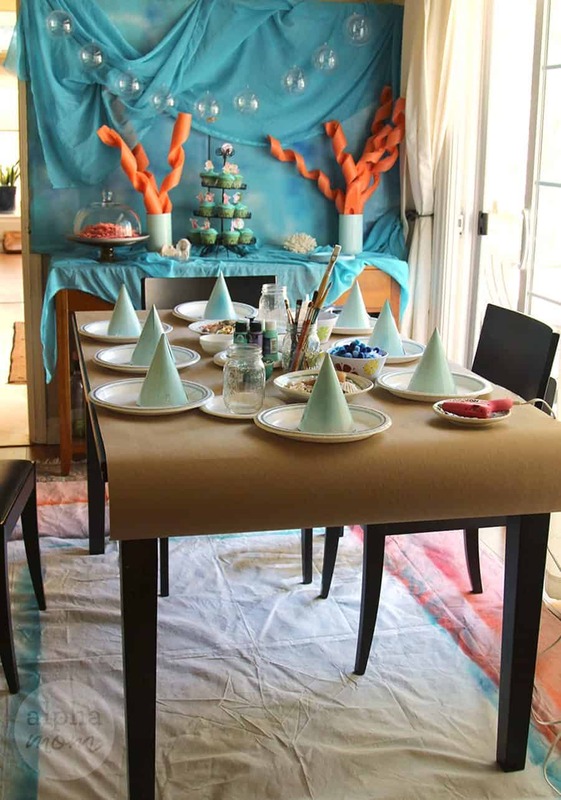 Find all of our Mermaid Party ideas here.